Players receive a fine of £10 per yellow card and £15 additional for every 5 yellow cards received. These fines are administration fees imposed by the Football Association. These rules are set for every tier of football across England including the EPL and Championship all they way down to Sunday League games.The FA is also responsible for other disciplinary action including suspensions. In addition, players are given suspensions for accumulation of cards. Accumulation of too many yellow cards at 5, 10, and 15 also results in a one match ban. A player who receives 20 yellow cards must meet with the FA disciplinary board and receives a five match ban. A red card suspension is based on why the red card was given and which rule was broken. Teams can be fined £25,000 by the Football Association if the team has 6 or more players cautioned or dismissed during a single match. In addition, some clubs will impose a fine on a specific player who receives a card or a suspension during a match. Teams may also dock players wages for matches that they are suspended. If you are interested in more information about yellow cards then check out my YouTube video on How yellow and red cards work in soccer. ← Does the English Premier League have a draft? 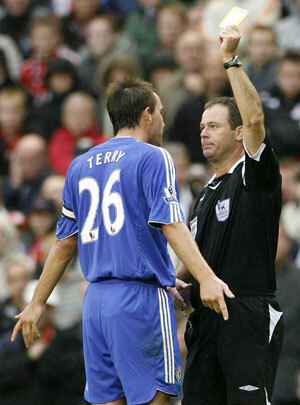 Home » Facts and Stats » How Much are Fines for Getting a Yellow Card in the English Premier League?